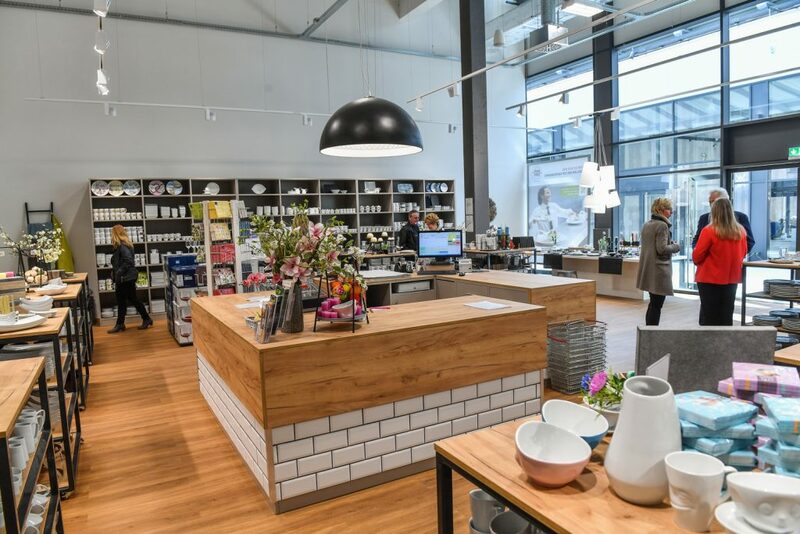 In the former kiln hall of the traditional Heinrich porcelain factory, a shopping world of around 5,000 sq m has now been created after 14 months of substantial renovation. However, the operators deliberately refrained from having a big opening ceremony, as the move into the kiln hall is only the first small step on the way to the large outlet centre. Practically at the same time as the opening, the surrounding factory buildings have now become vacant and will be torn down in order to expand the outlet by almost 70 percent. By the middle of next year, up to 65 shops including restaurants will attract customers from near and far on around 12,000 sq m of floor space. The centre will be linked to the city centre of Selb and thus grow to be one of the largest outlets in Germany. Once the outlet centre has been completed in its various stages of expansion, up to 1,000 people will be employed there. The inner-city project is developed and executed by the Munitor Group from Saarbrücken. “Selb is the largest outlet construction site in Germany – nowhere else is as much new development taking place as in the porcelain city. And once the entire project has been completed, Selb will be one of the five largest outlets in Germany,” explains Michael Haslinger, who with his HASLINGER RETAIL REAL ESTATE CONSULTING is responsible for the leasing of the individual shops and acquisition of potential rental partners. One huge advantage is that the city provides an already experienced and well-developed location with its outlet history of prominent porcelain manufacturers. In addition, the 15th outlet in Germany occupies one of the last blank spots on the map. Within a radius of 220 kilometres there is nothing similar like it. So, it is not surprising that the rental specialist from Adelsheim can already announce at this point: “We already have a rental rate of over 40 percent – and construction is only just beginning.” By the end of the year, Michael Haslinger would like to have concluded all contracts with the anchor- and key tenants. And he is confident: “I get almost only positive feedback everywhere and I think I’ll be able to lease all the space by this autumn. The potential tenants clearly see the opportunities that exist with the renovation of the existing buildings and the expansion of the sales areas by 70 percent. They also recognise the potential and purchasing power that exists not only in the far-reaching region, but also across the border in the nearby, heavily frequented health spas of Karlsbad, Marienbad and Franzensbad. “Within a radius of 90 minutes, the catchment area is estimated at over 4.2 million people,” says Haslinger. The world of top brands at the now opened Outlet Center will be brought to life in a very special environment. The brand stores with a modern architecture were integrated into the classic substance of the kiln hall without losing the industrial charm. The shops thus stand in an exciting contrast to the industrial chic of the building shell. “The move from the surrounding existing buildings to the new kiln hall has largely been completed. Five shops are currently open, a further eight will follow by mid-May, and tenants have already been found for the four units that will still be free-standing. 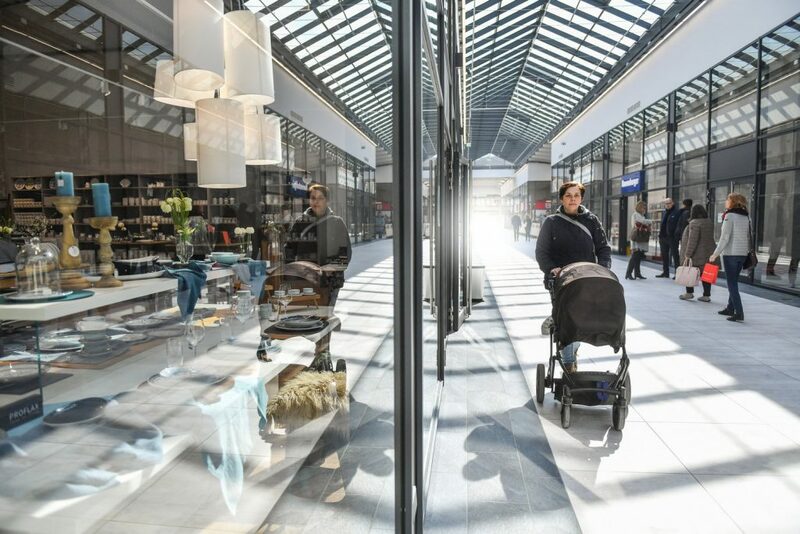 They will now start building their shops soon and will have moved in by summer,” explains centre manager Petra Dierck, who together with her team is part of CRM – CENTER & RETAIL MANAGEMENT GmbH from Mannheim. To date, the following brands have been confirmed: Lindt, Ravensburger, Villeroy & Boch, BHS Tabletop, Home & Cook, WMF, Goebel, Nina von C., Der Schuhladen and Factoria Steidl.